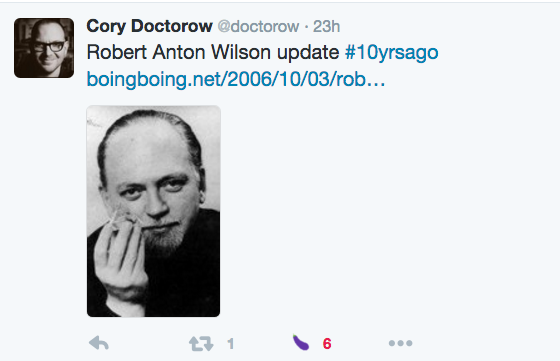 The folks at the Boing Boing blog like to Tweet out links to old entries, and yesterday science fiction author and Internet freedom activist Cory Doctorow sent out a link to a posting about Robert Anton Wilson; as you can see, it was sent out 23 hours ago as I write this. 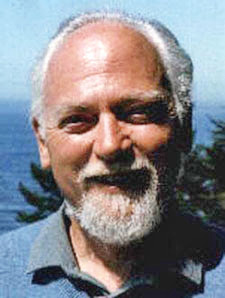 If you follow the link, you can see that it's an entry by Mark Frauenfelder, dated Oct. 3, 2006, about efforts to help RAW in his final months. (Before it became a mega-popular website, bOING bOING, founded by Mark and Carla Sinclair, was my favorite magazine. Once, when I'd gone for months without a new issue, I called the office phone number to see if it was still around, and talked to a woman who I like to assume was Carla). This was before I had started my blog, but I remember reading about RAW's plight and mailing some cash and a fan letter to what I thought was the right address. It came back "return to sender." Had he moved to the hospice by then? You can still browse the archive for the "RAW Week" articles at BOING BOING that Mark posted in 2012; it actually lasted for weeks and there's lot of articles there. Whenever I get into a conversation about favorite websites, I always say BoingBoing is my favorite, and "they're the coolest people on the Net." I have a hard copy of the 'zine version, with the interview with RAW.